Sonal Goel successfully defended her Masters Thesis. Thesis Document. Slides. 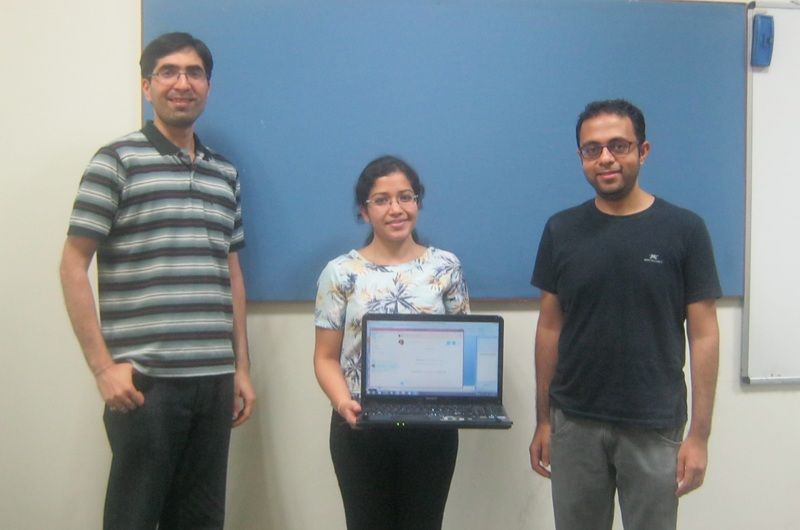 Paridhi Jain successfully defended her Ph.D. Thesis. Slides. Paridhi Jain's Ph.D. Thesis Defense. Automated Methods for Identity Resolution across Online Social Networks. 1730 - 1900hrs IST. April 25, 2016. Sonal Goel's M.Tech. Thesis Defense. Image Search for Improved Law and Order: Search, Analyze, Predict image spread on Twitter. 1600 - 1730hrs IST. April 25, 2016. Aritra Dhar (Alumni, 2014) accepts PhD offer from ETH, Zurich under Dr. Srdjan Capkun, System Security group. He also had offers from MPI SWS and Imperial College, London. Our 2015 - 2016 annual report. Captures our activities over the year. Ambuj joins internship under Prof. Mohan S Kankanhalli at Sensor-enhanced Social Media Centre, NUS for 6 months! Dr. Puneet Goyal, Ph.D. from Purdue University joins CERC as Core Faculty! Our paper "Online Social Media - New face of policing? A Survey Exploring Perceptions, Behavior, Challenges for Police Field Officers and Residents" gets accepted at 18th International Conference on Human-Computer Interaction. Authors: Niharika, PK. Our paper "On the Dynamics of Username Changing Behavior on Twitter" gets accepted at 3rd IKDD Conference on Data Science, 2016. Authors: Paridhi, PK. Our paper "Forensic Analysis of Linear and Non Linear Image Filtering Using Quantization Noise" gets accepted at ACM Transactions on Multimedia Computing Communication and Applications (ACM TOMM), 2015. Authors: Hareesh, AVS, and Prof. Sabu Emmanuel. Our paper "ACE - An Effective Anti-Forensic Contrast Enhancement Technique" gets accepted at IEEE Signal Processing Letters, 2015. Authors: Hareesh, AVS, and Prof. Sabu Emmanuel. IIIT-Delhi is now part ofInformation Security Education & Awareness Phase II project. The total worth of the project is 96.08 Crore Rupees (approx. 14.7 million USD). IIITD is one among 40 other institutes in the project. Project duration is for 5 years. CERC activity covered in IIITD's Newsletter. See page 3. 51 school teachers from Delhi / NCR attended our 'Master Trainers' Program. Staying Safe Online for School Teachers Report on CBSE website. Niharika presented her paper Online Social Networks and Police in India – Understanding the Perceptions, Behavior, Challenges at eCSCW 2015. Pic. 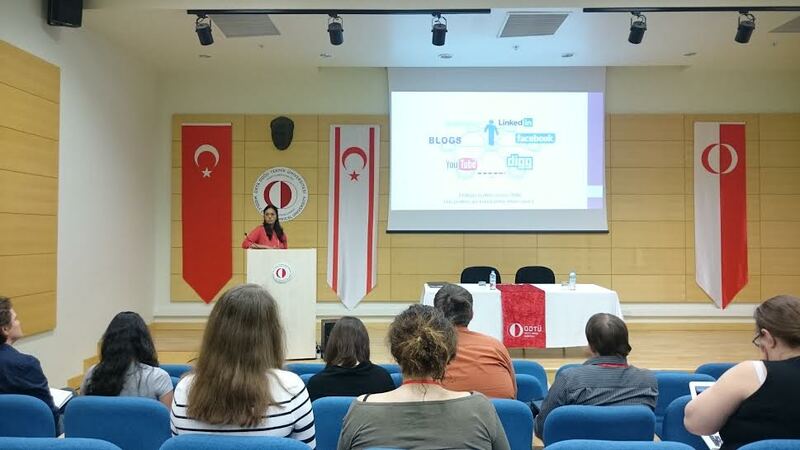 Paridhi presented her paper Other Times, Other Values: Leveraging Attribute History to Link User Profiles across Online Social Networks at Hypertext 2015. Pic. Anitra Dhar received the Best M.Tech. Thesis Award in CSE at the 4th Convocation of IIIT Delhi. Advisor: Prof. Rahul Purandare. Thesis Document. Prof. PK receives Teaching recognition from IIITD. This recognition is for CSE501 Designing Human Centered Systems that he taught Winter 2015 semester based on the feedback given by students from the course. Prof. Sambuddho Chakravarty receives Teaching recognition from IIITD. This recognition is for CSE3SE / 5SE Security Engineering that he taught Winter 2015 semester based on the feedback given by students from the course. Shobhita Saxena successfully defended her Masters Thesis. Thesis Document. Slides. Rahul Kumar Singh successfully defended his Masters Thesis. Thesis Document. Slides. Rahul Kumar Singh successfully defended his Masters Thesis. Anupama receives Best Paper Award at the 13th International conference on Privacy, Security, and Trust. Full paper. 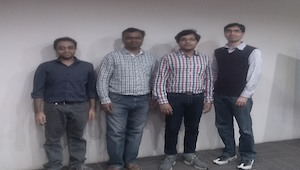 PK gave an invited talk on Privacy and Security in Online Social Media at IBM-IRL. Pictures. Aditi's work gets covered in The Telegraph and BBC News. Vaishali Garg successfully defended her Masters Thesis. Thesis Document. Slides. Niharika's work on Bengaluru's City Police Facebook page covered on Times of India, Page 2 on June 8, 2015. 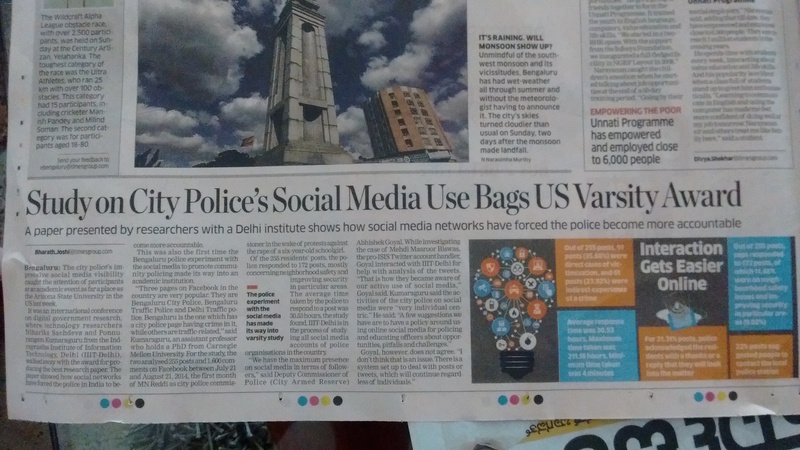 "Study on City Police's Social Media Use Bags US Varsity Award". Picture. PK quoted in Live Mint, May 26, 2015, National Edition (Centrespread). "Cyber bullying: Nip it in the bud". 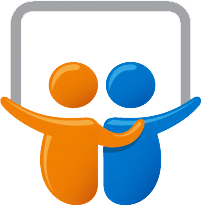 Our paper "Other Times, Other Values: Leveraging Attribute History to Link User Profiles across Online Social Networks" gets accepted at Hypertext, 2015. Authors: Paridhi, PK, and Prof. Joshi. Niharika receives Best Paper Award at the 16th Annual International Conference on Digital Government Research. Our paper "What They Do in Shadows: Twitter Underground Follower Market" gets accepted at the 13th Annual Conference on Privacy, Security and Trust (PST), 2015. Authors: Anupama, PK. Our paper "Towards Automatic Real Time Identification of Malicious Posts on Facebook" gets accepted at the 13th Annual Conference on Privacy, Security and Trust (PST), 2015. Authors: Prateek, PK. Our paper "Clotho:Saving Programs from Malformed Strings and Incorrect String-handling" gets accepted at Foundations of Software Engineering, 2015. Authors: Aritra, Rahul, Mohan, and Suresh. 260 school teachers and counsellors attended the Strategies for Safe and Effective Use of Online Social Media workshop. Picture. Our paper "Online Social Networks and Police in India – Understanding the Perceptions, Behavior, Challenges" gets accepted at the European conference on Computer-Supported Cooperative Work (ECSCW 2015). Authors: Niharika, PK. Our paper "Social Networks for Police and Residents in India: Exploring Online Communication for Crime Prevention" gets accepted at the 16th Annual International Conference on Digital Government Research. Authors: Niharika, PK. Our 2014 - 2015 annual report. Captures our activities over the year. Pictures from 3rd Security & Privacy Symposium. Prof. PK visited Coimbatore Institute of Technology and PSG College of Technology to deliver the ACM India Eminent Speaker Lectures. Pics. Volume 1, Issue 4 Nov. edition of Chronicles (IIITD's Newsletter) talks about CERC. See page 1. Prof. PK gave an invited talk on Building Usable Secure System at International Conference on Secure Knowledge Management in Big-data era. Picture. — Dec 8 - 9, 2014. We will be hosting 3rd Security and Privacy Symposium, Feb 14, 2015. Our Flier. Know more about CERC! Arita Dhar successfully defended his Masters Thesis. Dr. K. D. Nayak Director General, Dr. Athithan, Director Scientific Analysis Group, (SAG), and Mr. Susheel Verma, Director Cybersecurity, DRDO visited us. Dr. K. D. Nayak inaugurated our physical space. CERC showcased at India-US Technology Summit and at Knowledge Expo 2014. — Nov 18 - 21, 2014. CERC got a 3000+ Sqft space. Sambuddho's work on TOR gets slashdotted. 30+ students (studying some aspects of cybersecurity) from IGDTUW visited us. 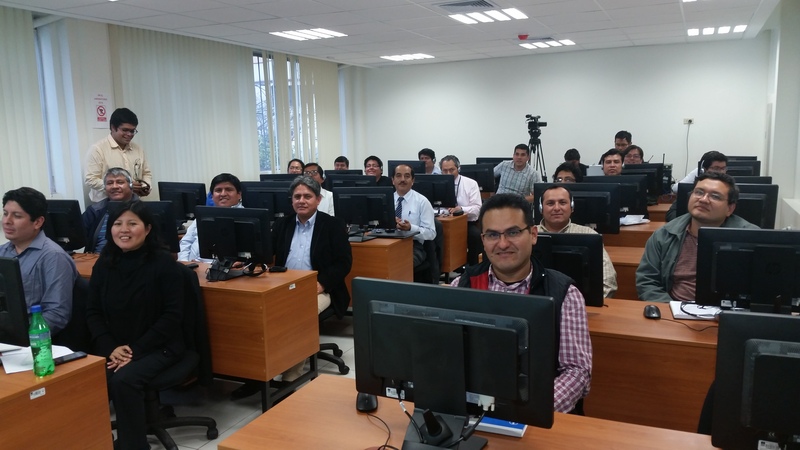 Dr. Acharya's Network Security course in Inictel-Uni, Lema, Peru. Dr. Acharya, delivering a 5 day course on Network Security, organized at Inictel-Uni, Lema, Peru. Niharika helps launch the Facebook page of Narcotics Control Bureau, India. Pics from the launch. 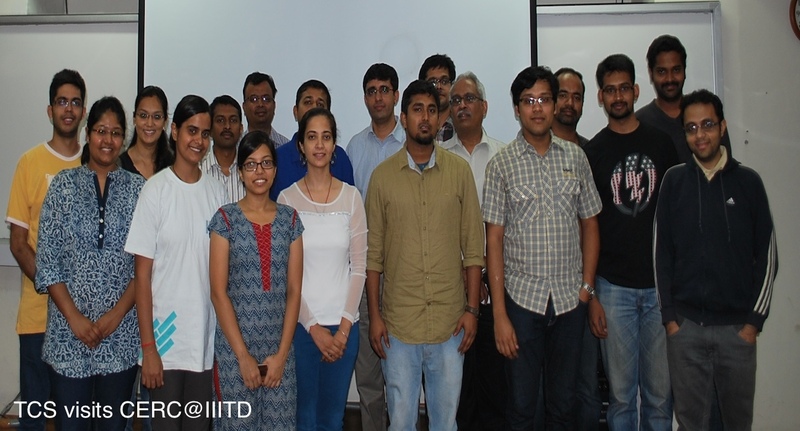 IIITD's Newsletter, Chronicles discusses CERC. Dr. Rahul Purandare will give a lecture on Static Analysis at CAIR, DRDO on November 12, 2014. 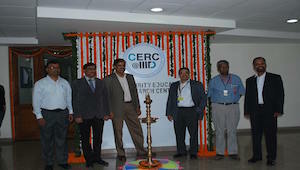 Four member team from TCS Research visited CERC. Open-To-All Lecture on Secure Programming by Prof. Matt Bishop from UCDavis. Our paper "bit.ly/malicious: Deep Dive into Short URL based e-Crime Detection." received best paper award at eCRS 2014. Congrats Neha, Anupama, and PK. 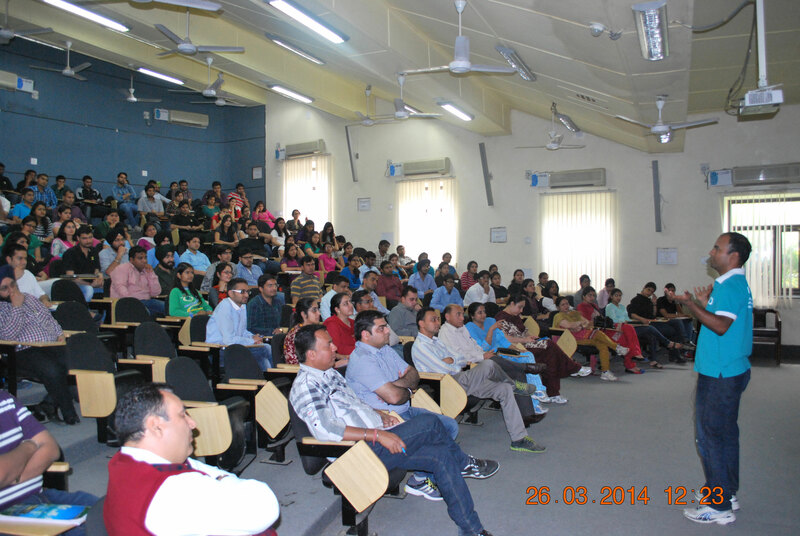 Prof. Chakravarty and PK visit Indira Gandhi Delhi Technical University for Women (IGDTUW) and deliver lectures. 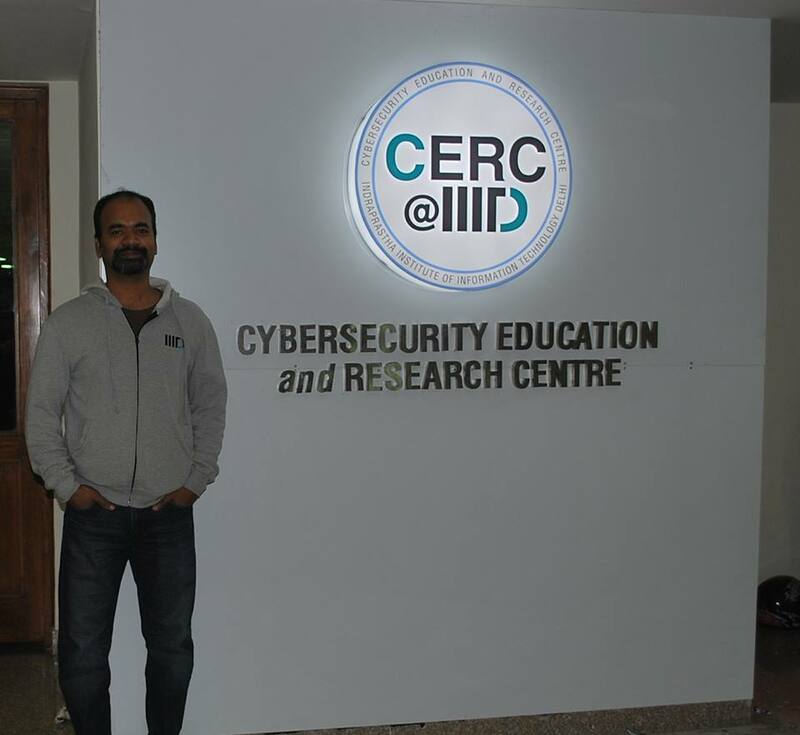 Dr. Rahul Purandare visited Centre for Artificial Intelligence & Robotics (CAIR) of DRDO in Bengaluru. Dr. PK gave his ACM India Eminent Speaker talk at the ACM Pune's Workshop on Cybersecurity Media. Dr. Chakravarty attended the ASSOCHAM's National Council on Cyber & Network Security Meeting. PK's article on Privacy and Security in Online Social Media published on Defence and Security Alert (DSA) magazine. Wombat Security Technologies received $ 6.7 Million. PK's Ph.D. thesis work contributed in creating Wombat. New technical report: "Analyzing Social and Stylometric Features to Identify Spear phishing Emails". Authors: Prateek Dewan, Anand Kashyap, and Ponnurangam Kumaraguru. New technical report: "bit.ly/malicious: Deep Dive into Short URL based e-Crime Detection". Authors: Neha Gupta, Anupama Aggarwal, and Ponnurangam Kumaraguru. New technical report: "Emerging Phishing Trends and Effectiveness of the Anti-Phishing Landing Page". Authors: Srishti Gupta, and Ponnurangam Kumaraguru. Sudip & Abhishek successfully defend their Masters Thesis! New technical report: "@I to @Me: An anatomy of username changing behavior on Twitter". Authors: Paridhi Jain, and Ponnurangam Kumaraguru. Our paper "Compression Noise Based Video Forgery Detection" accepted at International Conference on Image Processing (ICIP). Congrats Hareesh & Prof. AVS! New technical report: "TweetCred: A Real-time Web-based System for Assessing Credibility of Content on Twitter". Authors: Aditi Gupta, Ponnurangam Kumaraguru, Carlos Castillo, Patrick Meier. New technical report: "It Doesn’t Break Just on Twitter. 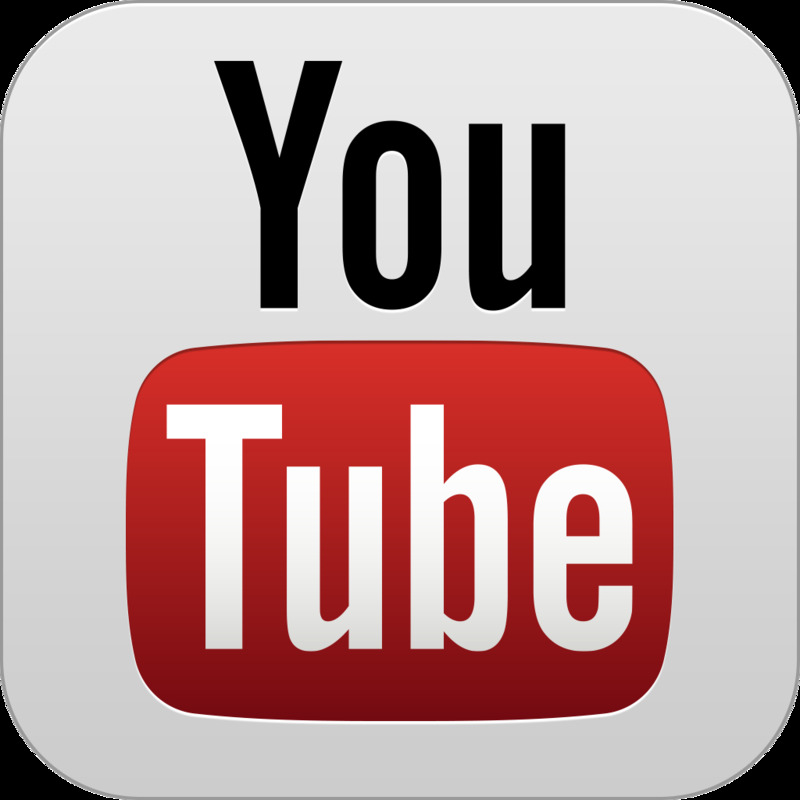 Characterizing Facebook content During Real World Events". Authors: Prateek and PK. TweetCred, our real-time system to assess credibility of content on Twitter goes live! Please use and participate. Covered in media, Daily Dot, Washington Post, Doha News, NewYorker. Neha Gupta successfully defended Masters Thesis today. Slides Video. 30+ participants attend the Web Application Security 101. Web Application Security 101, Introduction & Hands-on. Register now! Dr. Uri Rosenthal and his delegation from Netherlands visit CERC @ IIITD. PK presented about "Cybersecurity in India" at "First meeting of the Joint Committee on Science and Technology Peru-India"
Neha Gupta's M.Tech. Thesis Defense. Exploration of gaps in Bitly's spam detection and relevant countermeasures. 1100 - 1230hrs IST. April 24, 2014. Ari Klein from CrowdFlower blogs about Aditi's work, "When Should You Trust a Tweet?" 80+ students attend the CERC Info Session. As part of the ACM Eminent Speakers program, PK gave a talk on Privacy and Security in Online Social media at Thapar University. 260+ participants attended the talk. Inaugural CERC Seminar Series was well attended by 140+ participants. 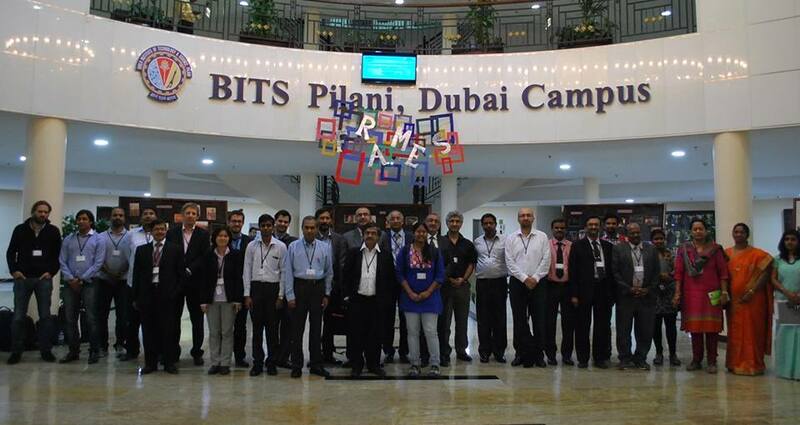 About 20% of the participants were from industry / other academic institutes. Our Advisory Board member Dr. Sundeep Oberoi from TCS visited us today. New technical report: "Online Social Media and Police in India: Behavior, Perceptions, Challenges". Authors: Niharika and PK. Mr. Sanjay Bahl, Profs. 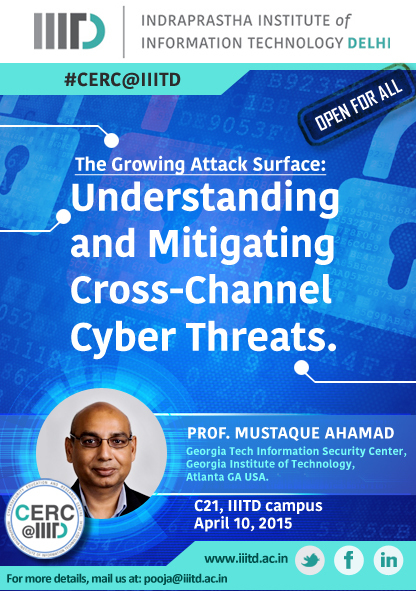 Purandare & PK will Co-organize a workshop and speak at the Security & Privacy Symposium. 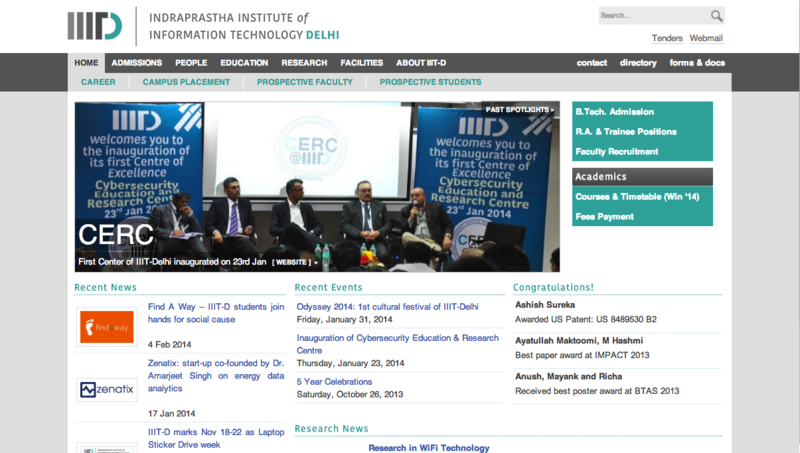 CERC inauguration on IIIT-D home page. An article on CERC in CIO & Leader Magazine. January 2014 edition, pp. 43. Profs Ashok, Matt, and Witty from Univ of Nebraska Lincoln http://t.co/qwiBqFap8R visiting #cercatiiitd tmrw! Welcome and Look forward. @niharikasachdev's "A Three-Way Investigation of a Game-CAPTCHA: Automated Attacks, Relay Attacks and Usability" accepted at #ASIACCS 14.